Yesterday, a group of 120 high school freshman students from Los Gatos High School published an amazing poetry anthology ebook, Windows to the Teenage Soul. If you're a parent, grandparent, educator, author or reader who cares about the future of books, I encourage you to go buy and enjoy this incredible book. It's available now at Smashwords, iBooks, Amazon or Barnes & Noble. 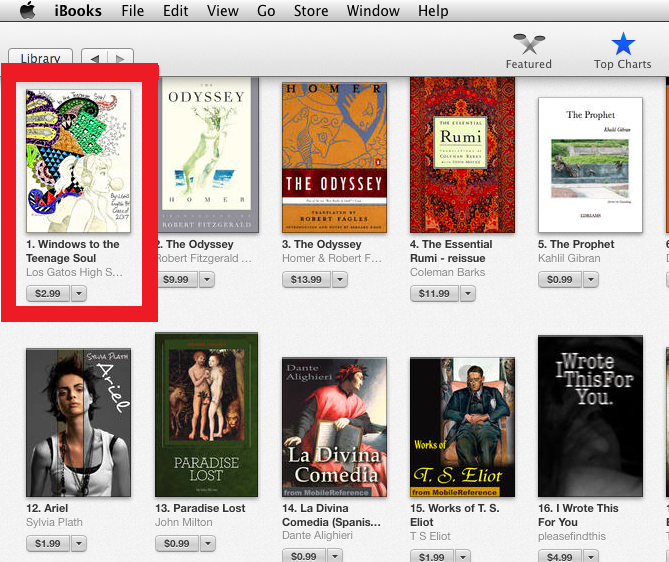 Yesterday it was the bestselling poetry book at iBooks. Buy it not because it's a great book (it is! ), but because this book will serve as the blueprint to help educators and parents around the globe bring similar ebook publishing projects to the classroom. 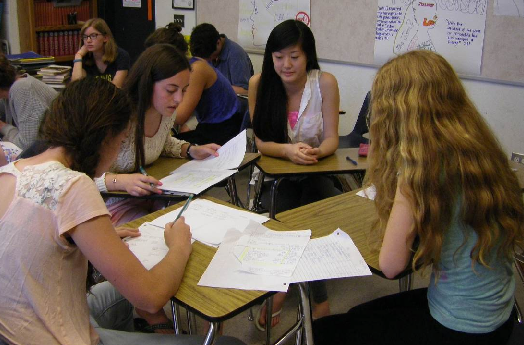 In addition to nearly 120 great poems organized under ten themes, it contains a Teacher's Guide that shares the step-by-step process this class followed to professionally write, edit, produce and publish a poetry anthology ebook in under five weeks. I wrote the preface to the Teacher's Guide. I want to see similar poetry and creative writing ebook publishing projects incorporated into the curriculum of classrooms around the globe. With your help, we can make it happen for the benefit of the children and young adults in every community. Thanks to free ebook publishing platforms such as Smashwords, the democratization of retail distribution, and the best practices publishing knowledge of indie authors, projects such as this are now feasible for elementary school students, high school students and college students around the globe. Such projects will teach students how to collaborate to write, produce and publish ebooks. In the process, the world's next generation of writers will gain a practical appreciation for the magic of words and the joy of publishing. The project grew out of an ongoing collaboration between The Los Gatos Public Library and Smashwords. For the last few years, I've been working with town librarian Henry Bankhead to develop community publishing programs in partnership with the library. The goal of our partnership is to identify systems, processes and initiatives that libraries everywhere can implement to foster a culture of professional authorship in their local communities. I blogged about our work with Los Gatos Public Library and my vision for libraries-as-community-publishing-portals last year for The Huffington Post. As I mentioned in the post, we ran a pilot program in which Smashwords presented three educational workshops at the library to help library staff and local writers learn how to e-publish like professionals. Following the initial pilot program with the library, Henry Bankhead and I started brainstorming how we could take our community publishing ideas to the next level. I thought it would be really cool if we could collaborate with my alma matter, Los Gatos High School, to incorporate an ebook publishing pilot project into the class curriculum for a creative writing class. The idea was that such a project would be really fun for the students, and would help them gain a practical appreciation for writing and publishing. So Henry arranged for the two of us to meet with teacher Tonya McQuade who taught three periods of freshman honors poetry classes of about 25 students each. Tonya agreed to lead the project, and also arranged for another freshman poetry teacher, Kathleen Wehr, to participate. Kathleen brought with her about 50 more students, increasing the total number of students to around 120. Henry Bankhead also applied for, and received, a modest grant to create a "mobile publishing lab" comprised of a Mac laptop, software and several iPads which were donated to the school to support the project. In my original project proposal, I suggested that that classes price their ebook at FREE, because that price would help the students reach the most readers. However, after speaking with fellow teachers, Tonya McQuade came up with the idea to give the book a price so the freshman class could use the book as a fundraiser to raise money for the students' 2016 senior ball. Cool beans! What a great idea! I gave two sets of presentations to each of the five classes, each about 50 minutes long. The first presentation was an Introduction to Ebook Publishing, and the second presentation focused on 16 best practices for professional ebook publishing. The goal of both presentations was to train the students how to think like a professional indie author. Download Ebook Publishing in the Classroom at Slideshare. I give permission to all educators to take my presentations and use them or modify them for use in their classrooms. Next, the students broke into different project teams to emulate the workflow and functional responsibilities of a professional publisher. The teams included Editing, Layout & Design, Art & Photography and Marketing & Publicity. There was a dual purpose to these breakout teams: 1. To help these young adults experience the processes and practices of professional publishing. 2. To get the book done! Without a distribution of responsibilities, it would have been impossible to pull off this project in a mere five weeks, and that's not counting nearly a week lost for spring break in the middle of the project! I encourage you to download the book because the comprehensive Teacher's Guide in the book's appendix shares the planning documents and the step-by-step timelines and processes followed by Tonya McQuade. It also includes photographs of the teams in action, a copy of their press release, and instructions on how to write and promote a press release. Last night the students held their book launch party at The Los Gatos Public Library. Over 100 students, proud parents and library patrons were on hand to hear the students give poetry readings from the book. The even was standing room only. Henry Bankhead tells me it was one the largest and most well-attended events held at the library in the last year. Library the May 6, 2014. Several students read their poems. I'd like to give special thanks to Tonya McQuade of Los Gatos High School. This was an ambitious, first-of-it's-kind pilot project, and it wouldn't have been possible without her leadership and passion. She believed in her students. She had the confidence that her students would rise to the occasion and attack this project with passion and enthusiasm, and that's exactly what they did. She represents the best of the best educators everywhere. And thanks to the power of ebook self publishing, fellow educators now have the tools they need to unlock, unleash and realize the creative potential that lives within every child and young adult. This important project - where group of high school students publish a bestselling poetry anthology available for purchase by a global audience at the world's largest retailers - would have been impossible just a few short years ago. What Gutenberg did for mass market print book publishing, ebook self-publishing will do for the future of digital books. More better books will be published thanks to self-publishing, and the earlier writers are exposed to self publishing best practices, the better their writing will become. If you're an indie author, educator, librarian or lover of books, you have an opportunity to help promote a culture of professional indie authorship in your community. Partner with your local library and school. Offer to be a mentor to provide local students and teachers the knowledge of how to self publish like a pro (these training presentations I gave above could just as easily be presented by a Smashwords author in the community!). Help schools build upon our experiences to implement similar ebook publishing class projects. With your help, the next generation of readers and writers will gain a new appreciation for books and the joy of self publishing. And with your help, projects such as this will lead to more better books for generations to come. This is amazing. Hands-on learning at its finest! Great article, Mark.ThIs is inspiring to say the least. I love what you did to help the kids and plan to share your article with my local library. (Perhaps it will plant seeds. )The history our young people make is usually lost after a few years––with ebooks it can be preserved forever. I also see ebooks as a means to record memories at class reunions. 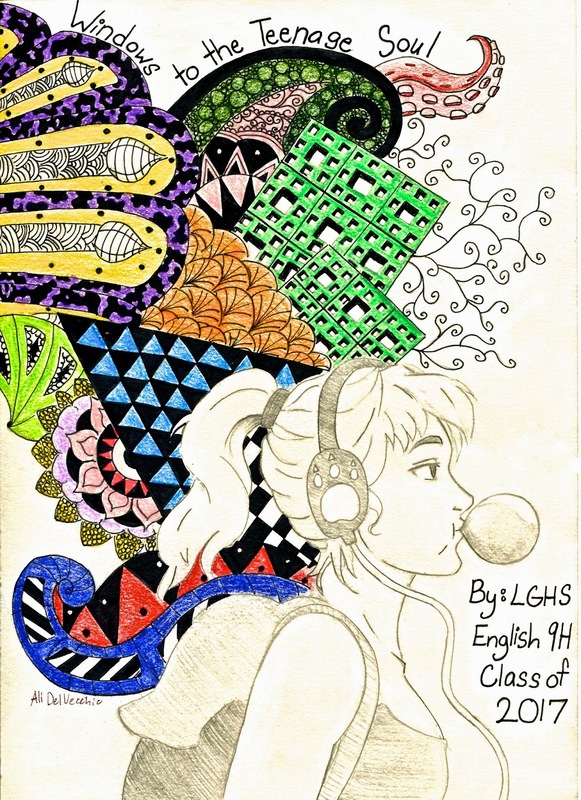 I will buy the book the Los Gatos High School Freshman produced. I know I will enjoy it and learn from it also. What a wonderful project, and an inspiring group of young adults & educators. Thank you for making the presentation materials available. You'll be helping a lot of young writers understand the opportunities now available to them. Great stuff! Very purposeful and inspiring--thanks so much for sharing this piece of news on the Smashwords blog! Amazing wonderful work, quite an inspiration! This is great! I need to contact the school and see if the kids want to blog books. That's been a dream of mine. This is so fantastic! I'm excited to spread the word and see if we can launch a project like this in my community - so cool. It's so exciting to read these comments! I'll be sure to share them with my students. I've been amazed at my students' poetry for years - it's wonderful they can share it this year with a larger audience and learn about self-publishing in the process! I'm inspired by these students and teachers to implement a form of this project as a library project at our school. Also passing this on to our staff. Thanks Mark, Smashwords, Ms. McQuade and Ms. Wehr. And thank you students for sharing your creativity with us all. Awesome! Such an amazing story!